​What the National Certified Register will mean for community and primary care nurses. What the National Certified Register will mean for community and primary care nurses. One in five people in the UK are affected by respiratory disease. It is responsible for more than 700,000 hospital admissions and more than 6 million inpatient bed-days in the UK each year. Spirometry is one of the lung function investigations in the diagnosis, severity assessment and monitoring of many respiratory conditions. Diagnostic spirometry has to be performed to a high standard. If it is not, there is a risk that the diagnosis will be wrong. As a result patients will receive inappropriate and expensive treatments. So it must be quality-assured and only performed and interpreted by people who have been assessed as competent, otherwise the accuracy of the diagnosis cannot be relied on. We have come a long way in primary care over the last 5-10 years, with far more people having access to spirometry in general practice – as part of the diagnosis of respiratory conditions and in the long-term monitoring of patients. In 2014, The Respiratory All Party Parliamentary Group (APPG) inquiry looked at why premature mortality from respiratory disease remained so high and how these death rates could be reduced. 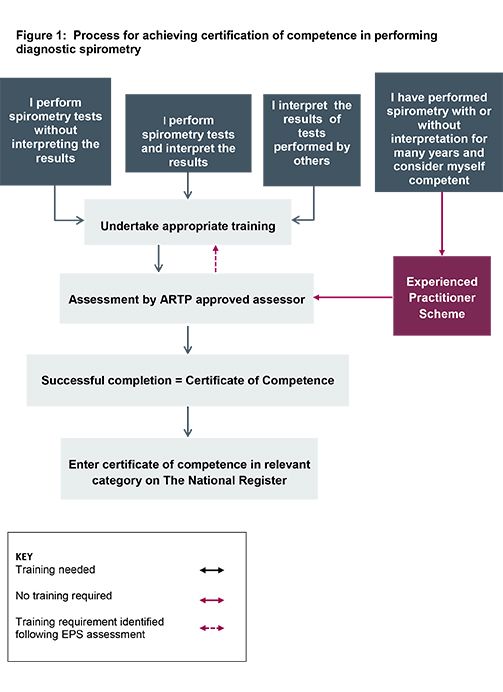 This focused attention on a key missing component – the need to have a national system of competency assessment of those undertaking diagnostic spirometry. Although a large percentage of spirometry is undertaken by well qualified nurses and healthcare assistants in community and primary care, it is unfortunately frequently reported that in primary care there is both misdiagnosis and missed diagnosis. As a result the quality of the spirometry tests has come under greater scrutiny. Spirometry is relatively simple test to undertake, but there are potentially many errors that can occur by those undertaking the test and those involved in the interpretation. To improve the quality of testing, work started back in 2010 to produce a practical, step-by-step guide to performing diagnostic spirometry, which was published in 2013. Following a 3 year process, in September 2016, the publication of a competency assessment framework for diagnostic spirometry was released. The framework emphasises the importance of performing diagnostic spirometry to a high and consistent standard. It also recognises the difference between performing the test, interpreting the findings to provide a report, and the separate clinical skills involved in making a diagnosis using the patient's history and examination. Patients with respiratory symptoms deserve an accurate diagnosis to receive the correct treatment. If it leads to raised standards, more accurate diagnosis, and ultimately improved care and better clinical outcomes, we will have succeeded. The framework has been co-produced by a stakeholder group comprising the Association for Respiratory Technology & Physiology, Association of Respiratory Nurse Specialists, Asthma UK, British Lung Foundation, British Thoracic Society, Education for Health and Primary Care Respiratory Society UK. It has been endorsed by NHS England. how healthcare professionals performing and/or interpreting diagnostic spirometry should be trained, assessed and certified. the 3 levels of competency. the routes available to gain initial certification. the Experienced Practitioner Scheme, which recognises previous experience and competence. how to join the National Register. The new arrangements will be phased in over 4 years up to 31 March 2021 to allow sufficient time for the necessary training, assessment and certification infrastructure to be set up across the country. Improving the quality of diagnostic spirometry will support accurate and timely clinical diagnosis, as well as improving the long-term monitoring of the one in five people in the UK affected by respiratory disease. The National Institute of Health and Care Excellence (NICE) is due to publish revised guidelines on asthma diagnosis in spring 2017. Foundation: those who have been assessed as competent to perform safe, accurate and reliable spirometry tests without interpretation. Full: those who have been assessed as competent to perform and interpret spirometry in terms of physiological changes. Interpretation only: those who have been assessed as competent in interpretation only. Implementation of this system will ensure that everyone – patients, individual healthcare professionals and commissioners of services – are clear about the standards required. Whatever the local service model, whoever performs and/or interprets spirometry must be certified as competent and follow the national standards. Some nurses – particularly those who have been performing and interpreting spirometry for a number of years – may be concerned by what they see as yet more red tape. But whether you are a patient, commissioner, employer or healthcare professional it is important to be assured that healthcare staff performing and/or interpreting diagnostic spirometry are competent to do so.